Crispy cubes of dough dip in a special soy sauce, I can eat these like candies! I actually have no recollection of eating bot chien as a child when I still lived in Vietnam. I was first introduced to this popular street snack in Seattle by my brother. The dough is pan fry to a crisp on the outside but soft and warm on the inside. It doesn't stop there, they scramble these crispy goodness with eggs. 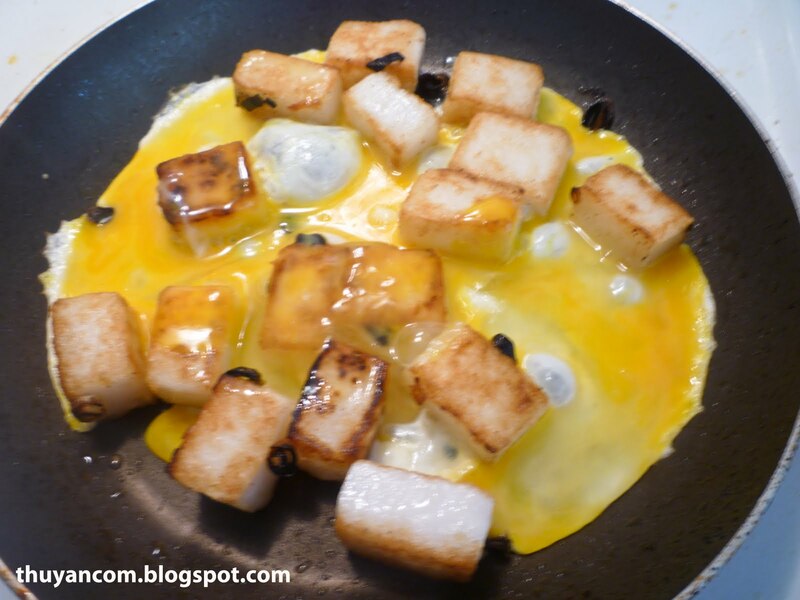 Eggs makes everything oh so more delicious! Banh Bot Chien is often pair with a plate of raw green papaya salad. I'm not sure why they are paired that way but the special soy sauce is very similar to the sauce eaten with Green Papaya Beef Jerky Salad. I always crave these but the thought of mixing flour, steaming, and then frying doesn't really work well with my schedule lately. 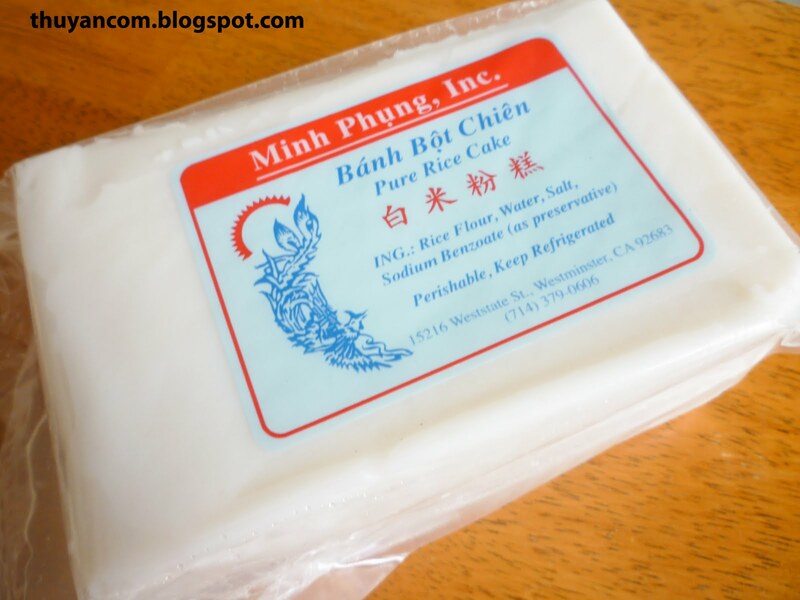 I'm so glad I found some premade cake at our local Vietnamese market. 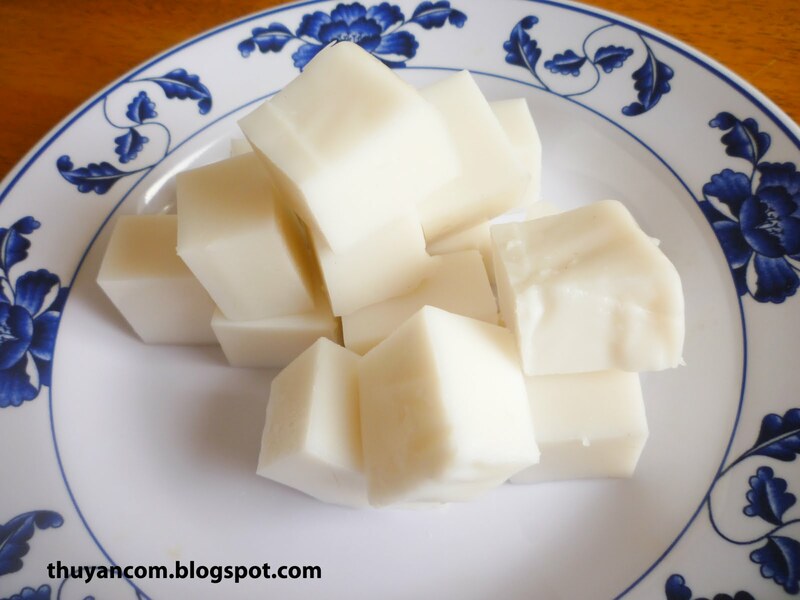 All you have to do is cut them into small cubes, and then start cooking. 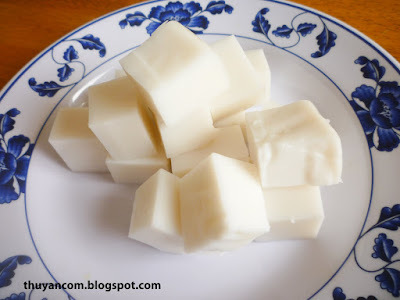 In Vietnam, we often eat Bot Chien after dinner almost like a dessert. Over here I like eating these at brunch, you got your eggs and carbohydrate to jump start your metabolism. 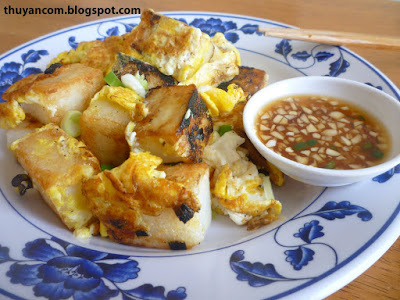 I would so take Bot Chien over pancakes any day! 1. Cut cake into the size of your liking. 2. Heat up a pan with a oil. 3. Add 1/2 of the green onions until your can smell fragrance. 4. Add cake cubes to the pan and let it fry to a crisp on the outside. 5. Once the cubes is to a crisp, slightly burned, add enough eggs to cover every single cube. Continue to flip and fry until the eggs are cook. 6. Sprinkle the remaining half of the green onions and serve. I can't believe you make these yourself, bot chien is my favourite "on-the-run" snack and like you I like lotsa egg :) Thanks for the recipe!